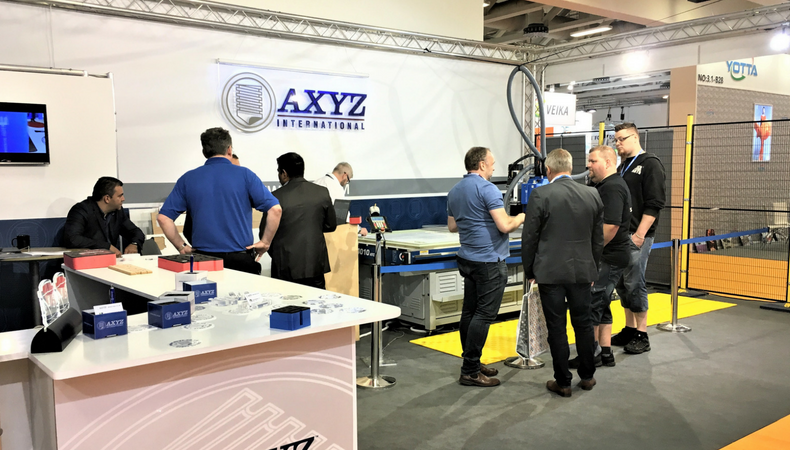 AXYZ International, a specialist in CNC routing, cutting and finishing systems, has paid tribute to its recent appearance at the 2018 FESPA Global Print Expo, saying that the event helped the company secure new business opportunities. The firm displayed a number of machines on its stand in Berlin and sounded out its AXYZ Trident print finishing system as the solution that proved most popular with visitors. The AXYZ Trident is a hybrid CNC production system that combines heavy-duty routing with fast knife cutting. Key features of the machine include the ability to process materials in widths ranging from 1,524mm to 2,159mm and lengths from 1,219mm right up to 15m. The device also boasts a hybrid triple head configuration and a high-power 10HP router spindle with integrated oscillating and tangential knife-cutting units. Speaking with visitors on its stand at FESPA 2018, AXYZ took the opportunity to explain the various applications that the AXYZ Trident can help to produce. The machine is able to process a wide range of materials common across the print finishing, sign-making, foam and graphics applications markets. For the graphics and print finishing sector, customers can use the AXYZ Trident for cut-to-print applications, using multiple tools for all materials. In terms of sign-making, the AXYZ Trident is well suited for all types of 2D and 3D signs in woods, metals and plastics. The AXYZ Trident can also be used for 2D and 3D processing with router and knife tools in foam packaging, while AXYZ said the machine can be put to use in the point-of-purchase, in that it can support the production of display stands, fixtures and fittings. Robert Marshall, vice-president market development at AXYZ, opened up to FESPA.com about the company’s approach at FESPA 2018, saying that the flexible nature of its kit proved a key selling point. “We were very pleased with the overall attendance at the event and in particular the large number of international visitors,” Marshall said. “This was welcomed by representatives from our global dealership network, many of whom had brought potential customers to FESPA to enable them to see demonstrations of AXYZ machines and to then make a first-hand assessment of how these could benefit their businesses. AXYZ has moved fast to keep this momentum going by preparing a series of new Trident machines for market. Although details of these solutions are being kept secret for the time being, AXYZ will soon release more details to the market.